Ribstone Ranch is a proposed new residential development to be built on 914 acres in the MD of Foothills south of Dunbow Road and north of Hwy 552. Adjacent communities include The Shannons, Norris Coulee, Harmony Ridge, Cara Ranch Estates, Deer Creek Estates, and Carnmoney Golf Course, along with a number of smaller and individual country residential properties. It will be a community that offers a diverse range of housing options while preserving over half of the site as open space (ER, MR and HOA). While the community will accommodate 2,600 homes, Ribstone Ranch will not feel like an urban community placed in the countryside. Aside from the country estate lots, all lots will back onto green space and follow a curved street system that works with the sites overall topography. Ribstone’s strategic density and piped services coupled with its thoughtful design, principled approach and attention to the smallest of details will strike a balance between supporting the MD’s growth and density goals for the Central District while creating a place future residents will be proud to call home and those who live near by will be proud to call neighbours. Highfield Investment Group (HIG), (formerly Theologian Management Ltd.) and WK Beattie Holdings have owned Ribstone Ranch since 1993. They hope to develop a unique community that is designed through extensive input by key stakeholders and the community at large. Using a planning and design philosophy that ensures a balance of social, environmental and economic values, the Ribstone Ranch team is excited and sincere about using a community approach to design for this project. Who is Highfield Investment Group (formerly Theologian Management Ltd.)? Headquartered in Calgary, Alberta, Highfield Investment Group (HIG) is a family owned organization that owns and manages a diverse portfolio of companies ranging from residential and industrial land development, to the hotel industry, to oil & gas services companies. David W. Munro, HIG founder and Chairman of the Board, is a lifelong entrepreneur who has extensive experience owning and operating public and private businesses in the oil & gas industry, furniture business, window & door manufacturing, farming, as well as many other business sectors. Highfield Stock Farm – 975-acre thoroughbred breeding farm south of Calgary. What is the proposed location for Ribstone Ranch? 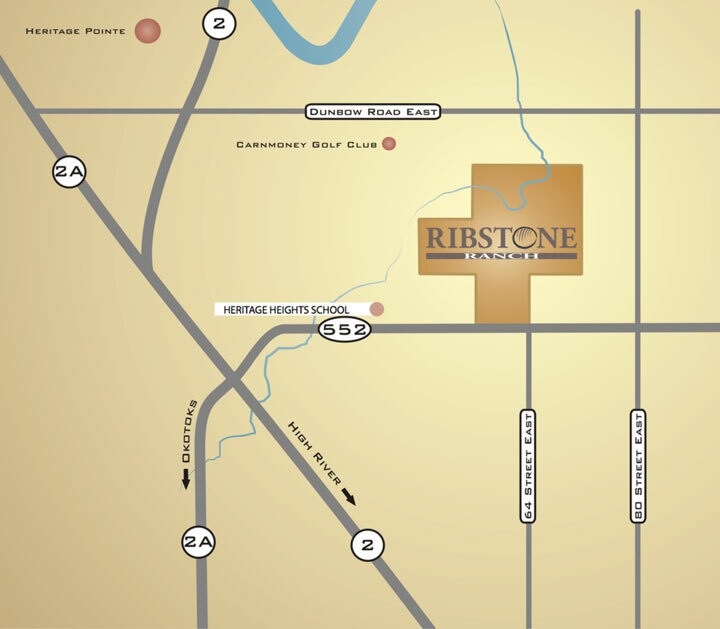 Ribstone is located within the identified Central District of the MD of Foothills no. 31. It is 914 acres located east of The Shannon’s development and north of Highway 552. It can currently be accessed using 64th Street. It is one half mile south of Dunbow Road, east of the Carnmoney Golf course. The Hunt family formerly owned the land. What are the general timeframes for the process? What opportunities are there for stakeholder input? What is the size of the planning area and how many homes are you planning to build? The site is 914 acres and it is anticipated that it will house 2,600 homes, which is equivalent to 2.8 units per acre as a maximum density. There will be a diverse range of housing options including single family, executive single family, villas and a seniors housing complex that will provide age-in-place and assisted living opportunities. Why is this form of development being proposed in this area? The MD has revised their Municipal Development Plan and Land Use Bylaw to accommodate and encourage densities of 3.0 to 5.0 units per acre. The MD has also designated this area as part of the “Central District” in their Growth Management Strategy where they want to see development occur. We are proposing to make an application for a Country Estate Residential Zoning on full water and wastewater utility servicing. The deep utility servicing will be scalable to allow for regional connections. This density is required to help pay for this kind of servicing and the road upgrades required accommodating it. Which portions of the community will be built first? Our current thinking is that the community will be built from west to east however this level of detail will be determined through consultation with the M.D. What type of housing forms will be built in Ribstone Ranch? What is the range in housing size? There will be a diverse range of housing options including single family, executive single family, villas and a seniors housing complex that will provide age-in-place and assisted living opportunities. Ribstone will consist of a high quality built housing form, with unified and quality architectural themes and design elements. We are offering a wide range of lot sizes and types to accommodate for a greater range of affordability. What is the proposed residential density? The density is proposed at a maximum of 2.8 units per acre on 914 acres, which is equal to 2,600 dwellings. What steps have been taken to preserve the rural character of the area? Over half of the site will be preserved as open space (ER, MR and HOA) to help retain the rural character of the area. The site is artfully and purposely designed so that almost every lot backs on to green space and there is no grid like street system and no rear lanes. The streets are curvilinear and work with the sites overall topography. The site is not designed with the intent of forcing an urban grid; rather it is designed with nature in mind. Keeping natural elements in the forefront of the design and the attention to fine details in the entry features and street design will promote the rural character of the community. How does building higher density housing in a country landscape preserve farmland? The MD’s Growth Management Plan suggests that if the Municipality supports higher density is specific locations, like the Central District, they can preclude growth in other areas. In other words clustering development in the Central District will allow for less fragmentation of farmland in other areas such as the East District, South Central District and South West District where farming and ranching are the predominate land uses. 68% of respondents to the MD’s growth management survey indicated that the Central District was the most appropriate location and should support the majority of the MD’s future growth. Will this new community impede on the lifestyle and views of its neighbouring communities? This is a difficult question as it is subjective for different people. The Ribstone Ranch team has done its best to create transitional buffers, preserve significant open space and embrace design principals aimed at minimizing the impact on our neighbours, maximizing the retention of the land’s rural character while meeting the MD’s objective of providing increased housing options in the Central District. What measures have been taken to create transitions or buffers for neighbouring communities? Building on the success of other local projects like Artesia at Heritage Pointe, the design for Ribstone Ranch incorporates interface buffer areas throughout the project. For example, an interface buffer area has been incorporated on the south end of the project adjacent to The Shannon’s. This buffer area consists of open space that will be planted and bermed as well as a transitional one-acre parcel area to the ravine, which allows for a softer edge condition. The pathways in The Shannon’s will be linked to the pathways in Ribstone allowing for greater mobility choice and longer routes for pathway use in the overall area. These pathways are connected on lands that would be considered as municipal reserve and, therefore, available for public use. Will Ribstone Ranch create a significant amount of light pollution? Street lighting has been designed to respectfully minimize the impact on the magnificent dark sky, which we believe to be part of the rural character. We are obligated to follow the MD’s dark skies bylaw and we will not have streetlights in the project outside of the primary access locations for safety purposes. What changes will be made to the transportation network to accommodate Ribstone Ranch? Dunbow Road will be twinned from Highway 2 to the site access on 56 Street E. Signals will be added to the Highway 2 interchange intersections as well as the site access. A roundabout or signal will be added at Dunbow Road/ 32 Street E. Intersections on Highway 552 between Highway 2 and Ribstone Ranch will be upgraded to include longer and wider turn, acceleration, and deceleration lanes. These upgrades are required to accommodate the full development of Ribstone Ranch and will be staged through the implementation of the project. The Highway 2 & Highway 552 interchange will require upgrades without consideration of Ribstone Ranch. These upgrades include the addition of a signal in the short-term and a wholesale upgrade of the interchange in the long-term. What will be the key access points to the community? Who will pay for transportation upgrades? The developer and other benefiting parties will pay for upgrades to Dunbow Road and local intersections on Highway 552. The interchange upgrade on Highway 552 & Highway 2 is required to support development in Okotoks without consideration of Ribstone Ranch and is therefore it is expected that Alberta Transportation will pay for it. What impact will Ribstone Ranch have on the capacity of volume of traffic on Dunbow Road? The full development of Ribstone Ranch will result in the need to twin Dunbow Road between Highway 2 and the Ribstone Ranch site access. Will Dunbow Road need to be twinned? Yes, Dunbow Road will need to be twinned between Highway 2 and the site access to accommodate the full development of the site. Will residents be able to access Ribstone Ranch through Norris Coulee/Shannons (48th Street)? A roadway connection from Ribstone Ranch to 48 Street is proposed. The connection may operate as either a full access or an emergency access. Will there be a through road on 64 Street North? The primary connection to Highway 552 will be a new roadway built west of 64 Street. 64 Street will remain in place to accommodate existing residents and other future development. The roadway would eventually connect to an internal roadway leading to Dunbow Road. What upgrades if any will be required for Highway 552? The intersections of 32 Street and 48 Street will need to be upgraded to include longer and wider turn lanes. How will water and wastewater be provided for Ribstone Ranch? A new water and wastewater system will be constructed for Ribstone Ranch that also has the ability to serve the region. The system would be constructed by the Developer and turned over to the Municipality once a sustainable number of connections have been reached. The operator of the system may be Corix. What measures have been put in place to manage storm water given the current drainage problems on the east side of lands and adjacent acreages? If there is runoff leaving the Ribstone Ranch site boundary, we will ensure this is at pre-development conditions or better in terms of quantity and quality. If it is run-on from their lands, we will provide safe conveyance within the Ribstone development boundary with ultimate release into the Bow River. Is there any concern that the capacity of the Corix license would not be enough for the proposed developments and is it anticipated to have any impact on further Heritage Pointe servicing? It will not have an impact on the Heritage Pointe servicing, they will be two separate systems. The Water Licenses for both systems will be separate. Will the Corix license to provide for current and/or future needs for other rural residents beyond Ribstone Ranch? The plan is to provide for current and future needs beyond the Ribstone Ranch. What recreational/amenities have been worked into the plan? The area is well serviced by existing amenities (rink, school, RV storage etc.). We anticipate the school site we have provided can support up to two schools to be built at the discretion of the Alberta government. Will pathway system be connected to the Shannons and/or Norris Coulee? Yes the pathway systems are designed to connect. What type of regulation will be in place for animal (dog) control and noise? Ribstone Ranch will fall under and therefore conform to the MD’s Community Standard Bylaw. Will garbage and recycling be included into the operating of the community? What level of Municipal Reserve has been built into the plan? 50% of the land will be designated as open space with 35% of overall land being designated as Municipal Reserve. Will there be horses and/or ATV/motorcycles be allowed to utilized the trail system? The goal is to synchronize path usage policies with MD’s pathway to Dunbow and Bow River. What form of commercial development has been incorporated into the plan? There is a 1.0-acre local commercial site incorporated into the plan. This will be for small-scale commercial providing local services (i.e. post office, convenience store). What fire/ems services will service Ribstone Ranch? The Heritage Pointe fire hall will service Ribstone Ranch and there will be hydrants within the community. What disturbance if any is anticipated to the flow of Snake Creek? The concern is that any disturbance will magnify already present flooding problems. There will be no disturbance. In fact we will meet or exceed Riparian Setback Matrix Objectives. Controlled post development flow rates will meet pre-development conditions. What are the anticipated downstream impacts on the river? The proposed storm water treatment train for runoff from Ribstone will provide for the enhancement of water quality of runoff entering the Snake Creek, Hunt Reservoir and ultimately the Bow River. What will be the impact on the Zoo animal adjacent areas? Through conversations with representatives from the Calgary Zoo it is not believed that Ribstone Ranch will have any impact on the animals at the sanctuary. What impact will development and increased population have on wildlife in area for example bird migration patterns, wildlife mobility and fish species etc.? Much of the natural habitat within Ribstone Ranch, in particular the riparian zone along Snake Creek, will be maintained as part of the network of open space within the community. This open space will continue to support a diversity of wildlife inhabiting wetlands, aspen forests and riparian habitats. The assortment of wildlife attracted to the area will be similar to that seen today and will likely include deer, coyotes, hawks, owls and waterfowl. These are all wildlife species that adapt well to areas where people live. The network of open space is also expected to continue to support local wildlife movements within Ribstone Ranch and to adjacent areas. Will the community maintain the dark skies policy? What schools will service Ribstone Ranch residents? The existing Heritage Heights School will service Ribstone families and the School site provided in Ribstone could support two high schools. What are densities of comparable communities such as Heritage Point? Heritage Pointe is a designated Hamlet in the MD which entails just over 1,000 acres, of which the lake and golf course cover 829 acres leaving 171 acres developable. The Lake, if you include the houses and the commercial centre, and deduct environmental reserve, is 504 units on 235 acres or 2.14 upa. Artesia is 272 housing units on 137.23 acres or 1.98 upa. People have noted that building Ribstone Ranch is like building Cimarron Estates in the middle of the Country. Is this a fair comparison? Cimarron Estates, is an urban community in Okotoks was designed with a non-typical road profile that mimicked rural-style residential design with ditches and no sidewalks, however, it contains rear lanes and higher densities, at exactly 4.97 upa or 2374 units on 478 acres. Cimarron is in fact one of the highest density communities in Okotoks. Okotoks generally averages 4.5 upa with their communities, the highest density in Okotoks “The Mesa’s” pushes around 7.0 upa and by comparison Drake’s Landing is 4.12 upa. The lowest density community in Okotoks is the Okotoks Air Ranch at 2.4 upa. The 640 acres of Cimarron also includes a Regional Shopping Centre and the Southbank Industrial Park. In total Cimarron “features” only 20 acres of its 478 as public park green space compared to the 400 acres (50%) we are providing in Ribstone. In contrast Ribstone Ranch is a large parcel of land: 914 acres in total which will be built out over a long period of time, potentially 20 to 25 years. Our initial concept plan proposed 2,600 homes, 377 of which are assisted living units for seniors. As mentioned above, over 50% of the total land will be left to green space. What we are proposing to build is very different from Cimarron and we don’t believe this comparison adds value to the conversation. Where can I learn more about the County’s growth policies that set the framework for Ribstone Ranch? January 2015 Land Use Bylaw. Corix was at your open house will they be the ultimate water treatment facility service provider? At this time, we have engaged Corix to help design the water treatment system and when it is operational we will tender a Request For Proposal from operators before formally deciding who will operate the system. Corix will certainly have an opportunity to respond and become the provider of the system. Will there be an additional burden for taxpayers as a result of water treatment facility in Ribstone Ranch? The intent is to create a system where all the costs of the systems operations are recovered through the user rates and the cost of the infrastructure is recovered from developers. We are still in the process of creating a model for this process. Is the intent to turn over ownership of the water treatment facility to the MD at any point? The intent is to develop a model whereby the capital costs of the system are recovered prior to the system being turned over to the MD. We are attempting to create a developer-funded model where the capital put in by the investors in the system is recovered through assessments paid by developers. At the time the capital costs are recovered the ownership of the system would revert to the MD. What will the home owner association fees be? At this time the homeowner association fees have not been set. Is it appropriate for Ribstone to rely on the Growth Management Strategy in the development of its concept plans when some are suggesting it doesn’t accurately reflect the views of residents surrounding Ribstone Ranch? The Growth Management Strategy is an MD wide policy and therefore we must rely on this and all other relevant MD policies in developing our proposal. That is the process. It is really no different than individuals complying with laws approved by elected officials. These policies outline the process by which developers are to design communities and by which Administration and Council evaluate them. That is why the MD conducts a great deal of public engagement in the development of these policies. The MD Administration conducted a comprehensive process over a year to gather feedback on the Growth Management Strategy, of which the survey was only one component. Was Ribstone’s initial launch in 2008 really because the developer wanted to listen to resident concerns or was it really delayed because of Bill Beattie’s death and complications to do with the estate? The project was delayed after our initial discussions with neighbours and the MD, not because of any issues surrounding our business partner, Bill Beattie’s, passing rather to give the MD the opportunity to proceed with and complete its Municipal Development Plan update, undertake its Growth Management Strategy and comprehensively revise the Land Use Bylaw which they now have done and all of which were subject to a public process and municipally supported open houses. The MD also wanted to understand the Calgary Metropolitan Plan and the Calgary Regional Partnership and their role in that organization and what it meant to the future of the MD. The CMP plan was originally rolled out in 2008 and the MD continues to revise and refine their role in the partnership. The CMP originally contemplated 8 to 10 units per acre on the Ribstone lands given their proximity to the City of Calgary and their serviceability by the Pine Creek wastewater treatment plant, should the MD have chosen to participate in that framework. We know this was not something the MD wanted, but there was a good conversation that emerged regarding what density in the MD looks like and the resultant GMS is a part of that conversation. Over this time frame and through these processes the MD has had an opportunity to engage residents both in this area and across the MD to determine the best strategy to manage growth in the future and outline this in the MDP, GMS and LUB. We were patient though this entire process and let in happen without any interference. How many units were proposed in your original concept plan and did that original plan propose the use of 48 Street? Ribstone Ranch’s first presented to our neighbours in January of 2008. This initial development envisioned more than 1,700 units and did not initially use 48 Street as an access point. We understand the concern the use of 48 Street poses for existing residents. This access point was included in the concepts you see today as a suggested option by the MD. This is an MD road, not a private road and other properties and quarter sections beside Ribstone gain access here. We have once again heard concerns from the community and will be discussing this with the MD as we move forward. We have heard some people have plans to oppose Ribstone to the province of Alberta, what role does the provincial government play in this process? Ribstone will be submitting its proposed Area Structure Plan to the MD of Foothills and it is their jurisdiction to evaluate, approve or reject the plan. However, we think it’s important to note that one of the conversations currently happening provincially is around legislated municipal participation in the Calgary Regional Partnership, which, if implemented, could dictate much higher urban style densities in this area. Ribstone Ranch presents an opportunity for the MD to align growth in this area with the policies it has worked diligently to create and approve over the last 8 years rather than have provincial decisions and Calgary aspirations overshadow an opportunity to create a community that maintains 50% of its open space, offers a diverse range of housing options and creates a community model that is fiscally and environmentally sustainable.